Zentangle tiles are quite small at 3.5" by 3.5" so as to be something one can complete in a short amount of time. 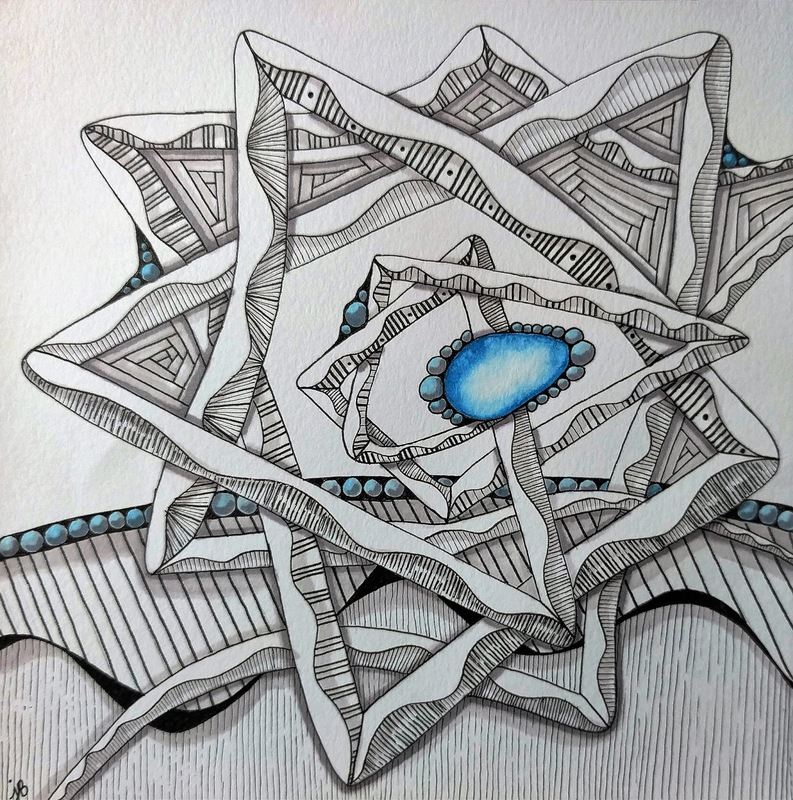 This constraint is another aspect of how the Zentangle Method is such an accessible art practice. In terms of taking on a new hobby and beginning a meditation practice, there is a convenience to knowing a simple tile can be completed in half an hour, or a complex one with detailed texture and shading in an afternoon. But given the small size of these pieces, scale is a principle of design that I often forget to take into account. In art, scale refers to the size of one object in relation to another. Variety of scale is an important part of creating a dynamic artwork. When I first started drawing this way, I made every pattern the same scale. I think seeing other tanglers' creations for the Adventures in Monotangles was the first place I recognized how varying the scale of a pattern could transform it. I challenged myself to try to work with tangles in more than one scale on each of my tiles this week. What stands out about auraknot to me is the way the ordered drawing-behind technique creates a weaving quality. What I like best about meer is the wavy ridge down the center that allows me to play with the idea of surfaces that face towards and away from the light. I used a Promarker Watercolor marker in Cerulean Blue for the gem and orbs, and I used Prismacolor markers in two shades of warm gray (30% and 50%) for the shading this time. I'm not sure if I achieved as much depth and contrast in the shading as I usually do when using graphite. With new tangle Abeko, a change of scale was easy as varying the size of the loops as I followed the spiral string in this week's prompt. Phroz has so many shapes within shapes that it needs some room to turn out right, but it was fun to pop a much larger version in the lower corner and bring out the 3D aspect of the pattern with shading. One reason that I am considering scale these days is that I have been having trouble with eye strain from working so detailed and so small. I've started cutting my own 6" x 6" tiles to make things easier on my eyes. Even at 6" x 6", these diminutive works are tiny delights with all the minute detail, the way small wobbles of line are packed tightly together creating a whimsy and an authenticity. What an impact then to see this type of art magnified to a much larger size, say taking up an entire wall? Looks like fun to me! Thank you for your kind words, Nadjezdah, and thank you for visiting! Your tiles are both very stunning! I love the way you have used Meer inside of your Auraknot. The shading with the markers looks good, but I do think that graphite gives a better shadow. At least when I try it, it does. I love the blue pops of color on your Diva tile too. Using various sizes of your tangles as you did in your IAST tile made a fascinating piece or art. You're right, scale can make such a difference. Beautiful work, both of them. Thanks so much, LezliB! Yes, I've been working on my shading with pencil for a while and love how it can transform a tile, but I'm still new to using markers. I think I need to get a few darker grays to really get the depth. Thanks for visiting! 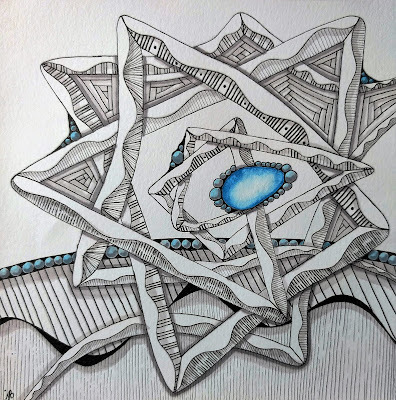 I'm glad to "meet" you back on the DIva's site, I like your art, your two tiles are beautiful and special with wonderful colored accents and contrasts! Hi Ria! Yes, it's been a while since I posted a Diva challenge tile, but I hope to continue. I've seen so many lovely colorful tiles lately that I had to make some too. Thanks for your sweet comments! Your IAST tile really deserve to be the tile of honors! Absolute beautiful. The Diva one also looks great. Thank you so much for your comments, Susan. I saw so many beautiful IAST tiles this week that I admired (including yours!) that I found it a delightful surprise. Thanks for visiting! I love them both! 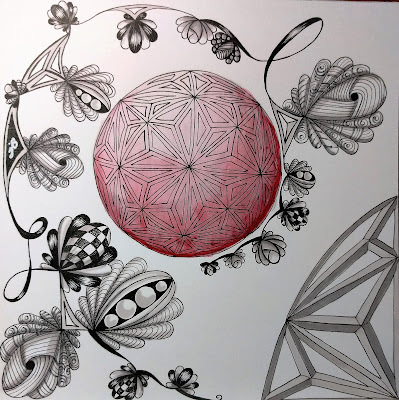 You have a nice way with the patterns & the pen:) I, too, live in WA state & i'd love to have a tangle buddy if you live anywhere near Centralia. Keep up the good work, you're a great inspiration to us all. Thanks so much, LindyLu! It's so nice to meet another tangler from WA state. I live just east of the Seattle area. If you ever come up this way, maybe we can meet for some coffee or tea & tangling!